At Draft Mode champion selection, each team selects one female champion to be designated as their “Queen.” Throughout the course of the game, both teams will attempt to kill the other team’s Queen. The first team to have their Queen die 7 times loses and must surrender. 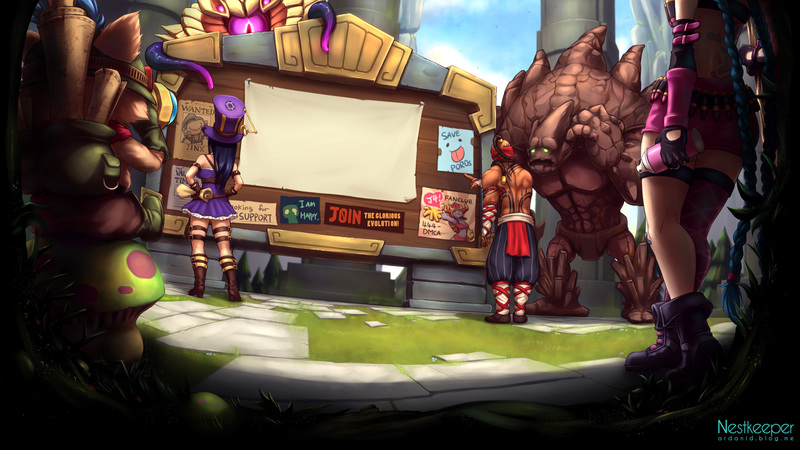 The playing field is limited is half of the jungle area of Summoner’s Rift. The team that picks second in Champion selection decides whether the game will use Baron’s side of the jungle, or Dragon’s. Once the playing field has been decided, all fighting must occur within the playing field. If at any time the Queen retreats outside of the playing field, she must immediately suicide to the enemy team and it shall be counted as a point. Please see the picture for an outline of the playing field. 1. Players are to avoid going within exp range of enemy minions at all times. If minions threaten to take down any Tower, players may use the Fortify Spell, if they have it. Otherwise they must let the Tower fall. 2. The Teleport summoner spell is not allowed. 3. The Blue Golem and Red Lizard as well as their helpers in the designated playing field may be killed by either team, but all other neutral monsters are to remain unharmed. 4. Once a Queen is slain, both teams may retreat out of the playing field. Players may chase enemy players as long as they remain in the playing field, but may not chase them once they have exited. 5. Once a Queen is slain, players not already in the enemy jungle may not enter the enemy jungle until both teams have 5 players in their respective jungles. 6. Once a Queen is slain and all combat has stopped, both teams are to return to their respective jungles. 7. Queens start the next round by signalling that their team is in their jungle. When both Queens have given their "Go", the round starts. 1. Upon death, the Queen is to return to the playing immediately and call out to the enemy team when she is back in play. 2. The Queen may not buy any items at any time during the match. However, she may purchase Oracle Elixers (She may not purchase any other types of elixers). 3. The Queen must run the Clairvoyance and Rally summoning spells. 1. Underlings may only return to the fountain to heal or shop after dying. 2. Underlings may purchase any items except for: Mejai's Soulstealer, Leviathan, and Sword of the Occult. 3. Underlings may not take the Clairvoyance or the Rally summoning spells. 4. As long as neither Queen has died, underlings may reenter the playing field immediately after respawning. If either Queen has died, they should wait until the reset. 5. If an Underling is executed (slain by a minion, turret, or neutral) they must remain at the fountain until at least 1 Queen is slain. If you have any suggestions or insights, please feel free to post! I’ll update this post after some play testing and as issues arise to keep the game as fun and balanced as possible. 5/22/11 - Snowball Items are no longer allowed. Underlings may no longer return the base without dying. Queen deaths to win reduced to 7. Changed wording of rules to count Queen suicide to minions as a point. Added rule regarding suicide to minions. Changed rules to allow all players to retreat outside of the playing field when a Queen is slain. 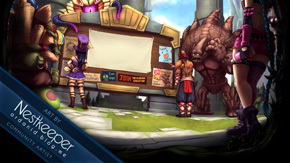 5/23/11 - Changed rule wording to prevent exp leeching from lanes. Added more info to FAQ. 5/24/11 - Added more info to FAQ, and moved it to second post so it doesn't clutter the first. 1. What happens if they're in our jungle and we kill their Queen but they kill ours afterwards? As long as your Queen remains in the jungle and their team does not leave your jungle and then reenter it, both Queen kills are counted. It's advisable for your Queen to immediately leave the jungle once their Queen has been slain, to prevent this from happening. 2. Do we have to stop fighting as soon as a Queen dies? If you are already engaged in combat or in a chase, you may continue. However, once either party exits the playing field, they should not be touched. Once all combat has ended, both teams should peacefully return to their respective jungles. 3. Our Queen just died in our jungle and their Queen is still in our jungle. Can we chase their team? Yes, you may pursue their team until they make it across the river and into their own jungle. You may not pursue them into their jungle. 4. Our Queen just died and we are in the enemy jungle. Can we chase their team? Yes, you may pursue their team until they exit the playing field. However, members of your team that were not in their jungle before the Queen died may not enter it. Once combat has stopped, you must exit their jungle until both teams have reset. 5. Where can a Queen run for her life? All players can move around the entire playing field as outlined in the picture once a round has started. 6. If a Queen dies can her underlings leave the jungle to avoid feeding? 7. If the allied Queen dies in her own forest do her underlings have to leave the forest to avoid being eaten, or does the enemy have to leave once the queen is dead? Fighting that has already begun (including chasing) may continue. However, champions that have exited the playing area are no longer fair game for attacking. Also, champions that are not already in the enemy's side of the jungle may not enter it to help their allies or secure further kills. Once fighting has subsided (no one chasing or fleeing), both sides return to their respective jungles. 8. Where exactly is the starting and stopping point of the fighting areas? Are the lanes next to the walls of the bases still considered jungle? The area between the treeline and the walls of the bases are fair game. The lanes themselves are not. For example, at the top lane near the top entrance to top team's base, the treeline stops at the lane and there are two entrances to the jungle in close proximity to each other. Players are not allowed to exit the jungle from one entrance and reenter it from the other. This is just the protect Soraka game but you just changed Soraka to "the queen." Uninspired and unoriginal. There is a Protect Soraka game? If that's what you're referring to it's quite a different game. But you didn't actually read my post, did you? I thought about that, but a good portion of the game should pass before poppy, or anyone else really, is able to reach level 6. Golem and Lizard don't give THAT much exp when split between 5 people. Why not? Teleporting to wards would make for some very interesting gameplay and opens up new juking possibilities.